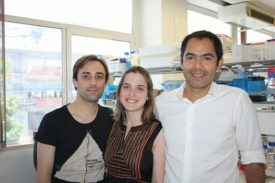 The team of researchers led by Professor Henrique Veiga-Fernandes, from the Institute of Molecular Medicine (IMM) at the Faculty of Medicine, University of Lisbon, has discovered a new mechanism which controls the survival, expansion and function of bone marrow stem cells. Haematopoietic stem cells (HSC) give origin to all blood cells. The transplantation of these cells has been extensively used in treating various diseases, with bone marrow, umbilical cord blood and peripheral blood progenitor cells as their main source. However, transplant protocols continue to face serious obstacles, particularly with regard to low transplant efficiency resulting from limited number of the HSCs available. In view of that, identifying new biological sources which could improve the survival of stem cells becomes absolutely critical to the efficiency of bone marrow transplants and to patients’ quality of life. According to the recently published study, the team has discovered a new molecule vital to the survival, expansion and transplantation of bone marrow stem cells, which could open up new horizons for future transplant protocols. In a statement, Professor Henrique Veiga-Fernandes said that “the current strategies of expanding bone marrow or umbilical cord cells present a great challenge, seen as such expansion involves a considerable loss of the cells’ function and therapeutic potential”. He also stressed: “We have demonstrated the existence of a ‘switch’ in stem cells which, when activated, selectively controls the survival of cells, at the same time keeping its function for the transplant intact”. A paper on the study has been published in a prominent international scientific journal Nature. The tests carried out involved genetic manipulation of RET protein and successful transplantation of human umbilical cord cells, with higher or lower protein expression, in animal models. The next step will be to study the survival, expansion and transplantation of the same type of stem cells in human patients. This discovery promises to bring significant advantages on the social level, as it can allow more patients to undergo a transplant. It is also likely that it will prove economically beneficial, leading to the reduction of medical costs. This is of particular importance since, as pointed out by the Agency for Health Research and Quality, transplants have been responsible for the fastest increase in hospital costs in the last decade.